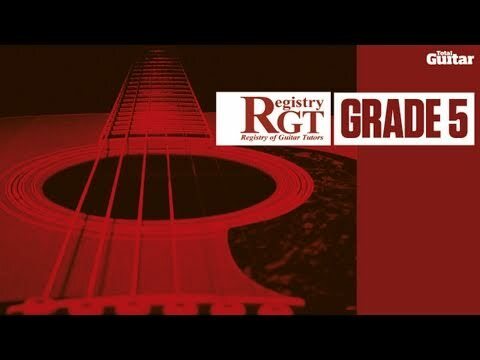 In the first lesson in this series, we looked at the introduction section of ‘Country Mood’ – one of the RGT’s Grade Five Acoustic Guitar Exam unaccompanied pieces. With, this lesson we’ll cover the first ten bars of the main piece, which forms the core theme of the piece. Click to read the first lesson in this series Country Mood Lesson Acoustic Grade 5 Exam. ‘Country Mood’ an arrangement of a typical traditional country, bluegrass-influenced piece. It’s chordal based and designed to be played using a pick. It features simple open G, C and D major chords – but with their sound made more interesting by playing the bass notes and the treble strings of each chord separately. 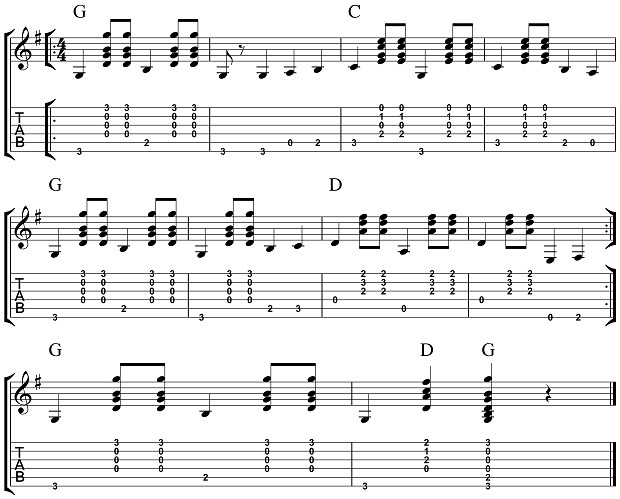 Some short bass lead-in notes link the changes from one chord to another. It’s essential that you play the bass notes strongly as they provide a melodic line of their own. Here is the tab and notation for the demonstrated example in the video below. This entry was posted in Acoustic Guitar Video Lessons and tagged RGT Country Mood by Alan. Bookmark the permalink.